David Rockefeller Sr. during an event in May 2015 to mark his donation of 1,000 acres of land to the Mount Desert Land and Garden Preserve. Rockefeller, who died last month at 101, in his will is leaving property, money and art behind in Maine, according to Forbes magazine. BDN file photo. David Rockefeller, the billionaire philanthropist who died last month at the age of 101, made sure in his will that some of his vast fortune and possessions will remain in Maine, where several generations of his family have summered for more than a century. At the time of his death, according to Forbes, Rockefeller was the oldest living billionaire in the world and had an estimated net worth of $3.3 billion. Several Maine organizations will benefit as a result of provisions in Rockefeller’s will, Forbes reported last week. 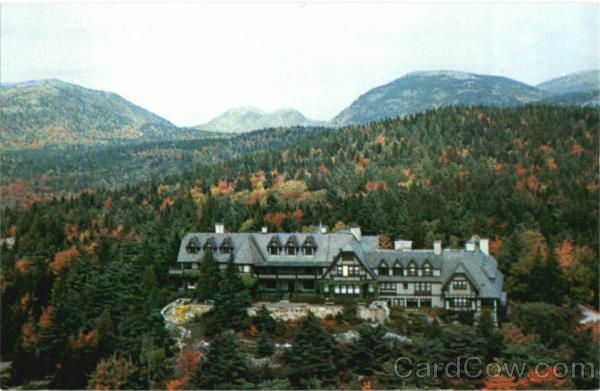 The most significant chunk of Rockefeller’s estate to remain in Maine is $20 million that will go to the Mount Desert Land and Garden Preserve, the board of which includes three of his children as members. Rockefeller gave generously to the preserve during his lifetime, including the gift of approximately 1,000 acres of contiguous land on Mount Desert Island in 2015. According to Forbes, Rockefeller left $5 million to land conservation group Maine Coast Heritage Trust. He willed Buckle Island, a small uninhabited island off Swan’s Island, to his daughter Eileen. A painting by Andrew Wyeth titled “River Cove” (seen below) was bequeathed to the Portland Museum of Art. Who will end up in possession of Rockefeller’s real estate holdings in and outside Maine (aside from Buckle Island) is not clear. Forbes reported that his children will have the chance to buy certain properties at fair market value — including the his 16-acre, $9 million Ringing Point estate off Cooksey Drive in Seal Harbor — but others will be donated to historic preservation trusts, land preserves or sold off to fund his philanthropic gifts. Such other properties appear likely to include a 40-acre parcel he owns east of Little Long Pond, where his parents 99-room “cottage” Eyrie once stood (see below). The property now is better known as the location of Abby Aldrich Rockefeller Garden, named after his mother, which was not included in the 2015 gift to the land and garden preserve. At the time, Rockefeller said the garden “will be made public in the future,” without specifying when. The will includes provisions for other works of art besides the Wyeth painting, according to Forbes. Some items of oriental sculpture located in the Abby Aldrich Rockefeller Garden will be divided between the land and garden preserve and the Museum of Fine Arts in Boston. The preserve will maintain a collection of Native American paintings and artifacts, which originally was assembled by his parents, where the collection currently exists inside Rockefeller’s Seal Harbor home.